Apple’s new mobile iOS looks more like Apple’s primary OS of the future. Apple will be releasing the next generation of their mobile iOS 4.2 today with plenty of upgrades that look to further position the iPad/iPhone as emerging enterprise/business tools of the trade. That said, the iOS managed power demands and intuitive interface is making the old Snow Leopard 10.6 primary OS look dated by the day. Multi-touch and 3D interface GUI (think Microsoft’s “Kinect”) are the way of the future. 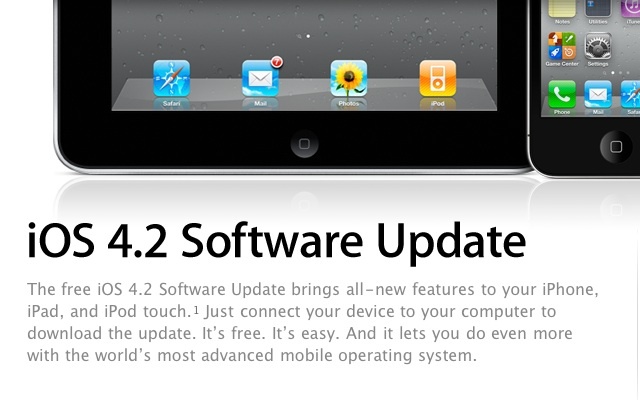 Apple knows this and its clear they intend to lead the wave with iOS 4.2. Apple says, “iPad users can now run their favorite apps and switch between them instantly, while preserving iPad’s legendary battery life. Users can organize their apps with drag-and-drop simplicity using Folders, and Mail now features a Unified Inbox, fast inbox switching and a threaded message view. Review: This is more in line with the other vendors offerings in the mobile space, “GameCenter” is Apple’s mobile attempt at social gaming, nothing really groundbreaking here. Review: We had expected this to be part of the big iTunes/Beatles release last week but its arrival is certainly welcomed. The ability to access and view all media formats on all devices is a definite plus. “AirPlay-enabled” speakers sounds fairly interesting. We’re hoping for AirPlay-enabled wireless headphones as well. Review (Update): While a seemingly simple addition, this should be a huge upgrade for the iOS platform capabilities. It would essentially reduces another need to jump to a laptop or desktop computer to print docs, etc. HOWEVER Apple’s first list of compatible printers only includes a handful of newer HP models so there’s no play on our version of AirPlay with printer connection. Its really a shame since the ability to tap/print via a mobile device is a big deal and further makes the iPad more functional especially in business and medical settings. A side note, all of the customizable, printable forms and docs used in Anavation and Anavoy will be one-touch printable via the Apple iOS 4.2 as well. Review: This is “Lo-Jack” for your iPhone. Its not only a great tool to find your list iPhone/iPad, but will make for an intriguing way to tracking down thefts of the said items by local law enforcement. I’ll bet Apple wishes they had this installed on their iPhone4 prototypes before the Gizmodo folks bought their ‘lost & found’ copy. Review: Sounds cool, we’re downloading it now. This entry was posted in Adaptive Management Infrastructure, Anavation, Anavoy, Apple, Business Software, communication, Microsoft, mobile computing, tablet computing, technology, telephones, Uncategorized and tagged AnaTango by robmayeda. Bookmark the permalink.